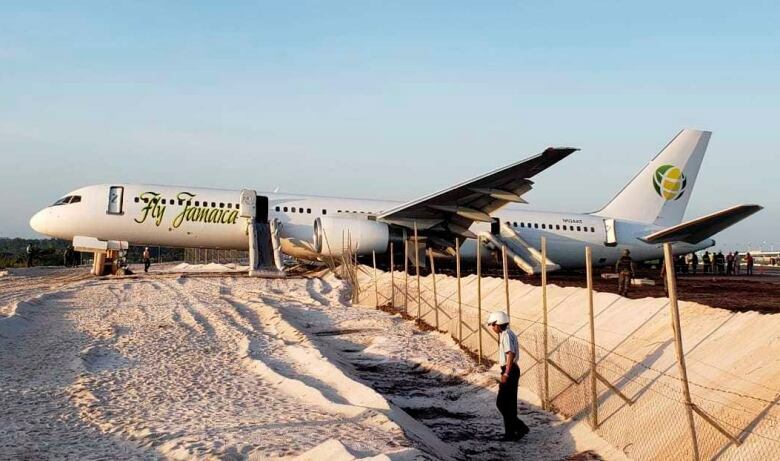 Six people were injured after a Fly Jamaica plane on a flight from Guyana to Toronto crash landed overnight at Guyana's Cheddi Jagan International Airport. Dozens of Canadians were among those aboard. 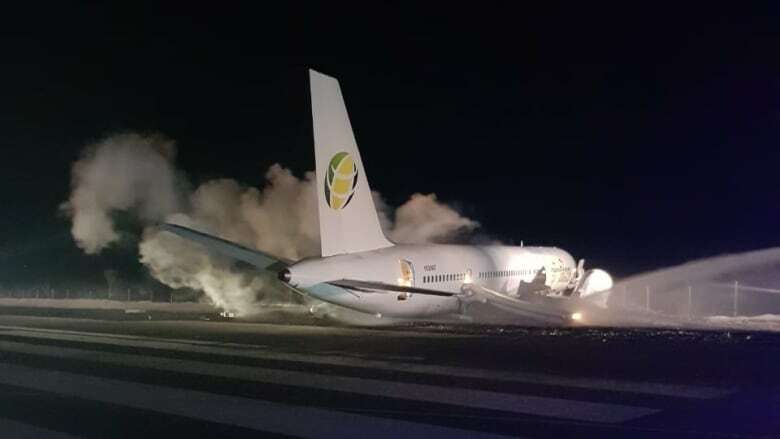 Six people were injured after a Fly Jamaica plane on a flight from Guyana to Toronto crash landed overnight at Guyana's Cheddi Jagan International Airport. Eighty-two of the passengers are Canadian citizens, according to local media reports that cited David Patterson, Guyana's minister of public infrastructure. 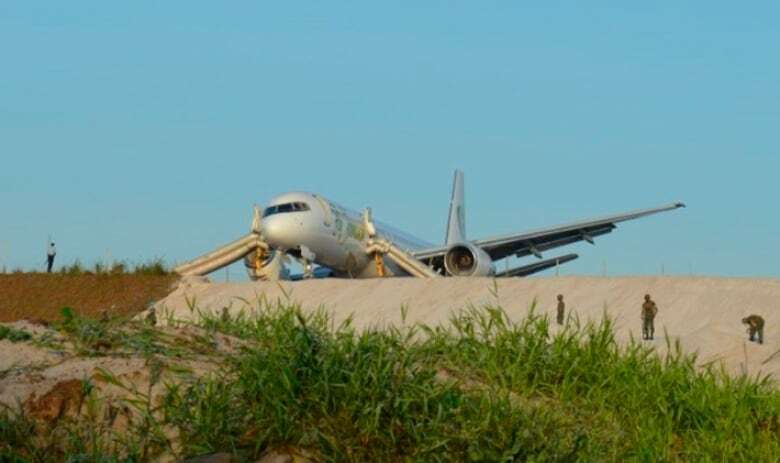 Images posted on the airport's Facebook page show the plane appearing to have gone through a chain link fence, with one of its engines tilted upward and resting on the fencing. An emergency inflatable slide had been deployed from one of the front doors. Invor Bedessee was sitting near the cockpit during the flight. According to him, the plane's departure was delayed about 45 minutes as crews addressed a mechanical problem. Takeoff was smooth, but other passengers became anxious after the pilot revealed they were returning to Georgetown. Bedessee said it seemed that once the aircraft landed, its brakes were not functioning properly. The plane eventually rolled to a stop after a spiked rumble strip laid across the runway by an airport ground crew punctured several tires on its right side. "We crashed into a big sand pile at an edge of a cliff. There's a big drop about 30-40 feet [nine to 12 metres] on the other side. If we had 10 more feet [three metres], we would be down in the ditch," he said, adding it's a "miracle of miracles" that no one was more badly hurt during the crash and subsequent evacuation. Those injured are in non-life-threatening condition and being treated at a local hospital. Rabina Roopnarine awoke to a call from her mother, Bebe Ali, who was among those on the plane. Ali, a resident of Toronto, flew to Georgetown two weeks ago for her brother's funeral. She was supposed to land at Pearson International Airport at 7 a.m. ET. Friday. Ali used a flight attendant's cellphone to contact her daughter from the hospital shortly after the crash landing. Roopnarine said she was told the plane was filled with smoke and passengers were trying to force their way off. Ali injured her neck and back sliding down the emergency chute, her daughter said. Local police have cordoned off part of the airport and an investigation into the circumstances of the incident is underway, according to officials. A representative from the U.S. National Transportation Safety Board is expected to assist in the probe. Patterson is expected to provide an update on the incident at some point on Friday. The airport has also set up a hotline for family members looking for assistance and information. In a Facebook post, Fly Jamaica said it is currently contacting customers to make arrangements for their return to Toronto.